Members of the People’s Militia which sprang up to defend the Spanish Republic. The Spanish Civil War was one of the most controversial conflicts of the last century, producing an immense historiography comparable to more decisive events such as the Russian Revolution. This is all the more surprising given Spain’s reputation at the time as an isolated backwater. When the war broke out in July 1936 The Times judged it an anachronistic struggle irrelevant to modern Europe. Spain was seen as a fading power, stifled by a regressive society and subject to the sort of social and political extremism which modern Europe had outgrown. Why then is the Spanish Civil War one of the most studied conflicts of the last century? Partly because the initial judgement of The Times proved so mistaken. Far from being irrelevant to Europe, the devastation of Spain by the forces of fascism, communism and nationalism foreshadowed the conflict of 1939-45. It has even been argued that Spain marked the beginning of the war against fascism—an interpretation implicitly critical of the democratic states for standing aside while a fascist rebellion overthrew a legally elected government. It may frustrate Spaniards for whom their civil war was a complex and divisive affair but much of the interest in Spain lies in the fact that people throughout the world strongly identified with what they saw as the clear-cut issues involved. Like the later US war in Vietnam, Spain gripped international attention, forced individuals to take sides and motivated activists whose influence was felt far beyond Spain. For some idealists it was the last great romantic cause. Left-wing organisations, notably the Communist Party, see the formation of the International Brigades—the 45,000-strong army of international volunteers which fought for the Spanish Republic —as one of the great events of working class struggle. Their sacrifice stands testament to the idealism, political commitment and belief in interventionism of that generation. But part of the war’s intrinsic interest also lies in its complexity and resistance to simple interpretations. Many socialists now see Spain as a great betrayal rather than a glorious failure. For example, Ken Loach’s film, Land and Freedom, partly inspired by George Orwell’s Homage to Catalonia, depicts a Spanish Republic in which the oppressors were communists and their victims the anarchist and Trotskyite left. The tendency to view Spain as a lesson from history accounts for much of the popular interest in the war. Spain symbolised a wider struggle not only for political activists but also for many artists and intelligentsia. In Ireland, as elsewhere, the Spanish Civil War has served as a sort of shorthand for moral or political positions. For example, Christy Moore’s popular ballad, ‘Vive el Quinte Brigada’ juxtaposes the Irish ‘comradeship of heroes’ in the International Brigades with the reactionary clericalism of ‘Maynooth’. Gerry Evans’ character in Brian Friel’s Dancing at Lughnasa typifies the archetypal romantic hero associated with the International Brigades. Similarly, the International Brigade veterans of Jim Nolan’s Guernica Hotel and Paul Vincent Carroll’s The Wise Have Not Spoken represent disillusioned idealists for whom gombeen Ireland held no welcome. That historical figures as represented in fragments of a poem, song or film fall short of a more complex historical reality is understandable but perhaps more significant is the way in which popular culture can serve to alter public memory. Nowadays many would be surprised to learn that the vast majority of Irish people supported Franco rather than Spain’s democratic government. Memorial banner of the Irish section of the International Brigade. Similarly surprising, given the public esteem with which the Irish International Brigaders of the Connolly Column are regarded and the obscurity of O’Duffy’s Irish Brigade, is the fact that the great majority of Irishmen who fought in Spain did so under General Franco. To understand why one must consider the Irish response to the outbreak of the war. On 20 July 1936 reports of a rebellion by army officers in Spain appeared in Irish newspapers. The Irish Independent, which would become the loudest cheerleader of the pro-Franco lobby, warned that a victory for the Spanish government would lead to a ‘Soviet State’ and urged its readers to support the Nationalists ‘who stand for the ancient faith and traditions of Spain’. The somewhat less gung-ho Irish Press also approved of Franco. His rebellion ‘must have a large measure of public support’ because of the Republican government’s anti-clericalism—‘churches have been burned, schools secularised, Communistic schemes carried out’. Clergy, politicians and the provincial and Catholic press echoed these concerns more forcefully. Within weeks the Irish hierarchy was calling for Franco’s victory. In the face of this strong pro-Franco consensus, a tiny campaign of support for the Spanish Republic, organised by a small number of left-wing republicans and communists struggled to be heard. By the autumn of 1936 pro-Franco meetings were sweeping the country and two military brigades were preparing to fight each other in Spain. Why were Irish people so interested in the war? Essentially because Spain was seen as a religious rather than political conflict. Most people knew little about Spain or its complicated politics when Franco’s rebellion broke out. But Spain was regarded, like Ireland, as a historically Catholic nation, a perception derived from the importance of events such as the Battle of Kinsale, the flight of the Wild Geese and the training of Irish seminarians in Salamanca in popular nationalist history. Spain’s more recent history—the establishment of the Spanish Republic in 1931 and its radical anti-clericalism—was viewed rather differently. For a number of years the Irish bishops and Catholic press had portrayed Spain as a Catholic state besieged by communism and atheism. When the civil war began the complexities of the conflict were largely ignored. That the Republic comprised not just communists, but socialists, liberals, middle-class progressives, landless labourers, workers, Catalonians and Catholic Basques, was little reported. Similarly, that Franco’s Nationalists comprised not just much of the clergy but a reactionary coalition of fascists, army officers, landowners and industrialists was not much remarked on. Instead public debate was dominated by the anti-clerical violence that swept Republican Spain after Franco’s rebellion when twelve bishops, about 4,000 priests, 2,000 monks and 300 nuns were murdered. The sensational press reports of these atrocities, often embellished in highly emotive accounts, had an enormous impact on Catholic Ireland. The reaction of Irish Protestants, in contrast, was more muted. The Irish Times, to some extent still the organ of Protestant imperial opinion, adopted a mild pro-republican stance and reported the atrocities of both sides. In Northern Ireland, unionists generally looked unfavourably on both Franco and the Republic but many unionist leaders attributed Spain’s difficulties to the malign influences of both Catholicism and republicanism. There is no room any longer for any doubts as to the issue at stake in the Spanish conflict…It is a question of whether Spain will remain as she has been so long, a Christian and Catholic land, or a Bolshevist and anti-God one. The depiction of a holy war continued in the following year’s Lenten pastorals where more attention was devoted to communism and the Spanish Civil War than any other issue. Bishop O’Kane declared Spain a struggle ‘between God and the powers of darkness’. Bishop Doorly described it as ‘a war between Christ and anti-Christ’. Bishop Fogarty declared Franco’s soldiers ‘gallant champions of the Cross who are fighting so gloriously for Christ. How can such fervent partisanship be explained? The Irish hierarchy was genuinely worried about Spain. As Bishop Mageean warned, if Catholic Spain had succumbed to communism ‘who will be so rash as to prophesy what the situation may be here in Ireland in ten years time if we pursue the policy of drift’. But, as Mageean’s statement implies, the church also used the example of Spain to warn against the influence of left-wing, liberal and secular trends in Irish society. Anyone who supports the Spanish government supports church burning and priest slaughter. We should wish for the success of the Patriot arms in Spain, not that we are the least concerned with the temporal issues at stake there, but that we want the advance guard of the anti-God forces stopped in Spain and thereby from reaching our shores. The ICF spread throughout Ireland, organising a series of public meetings at which local priests, politicians and trade unionists declared their support for Franco. Over 40,000 people attended a Cork meeting in September 1936 which typified the fervent response to Spain. Monsignor Sexton, dean of Cork, blamed the Spanish civil war on ‘a gang of murderous Jews in Moscow’. The academic, Alfred O’Rahilly, described the stripping, crucifixion and burning of Spanish nuns and criticised the Irish government’s neutrality. The crowd crossed their hands above their hands to pledge loyalty to the ICF and Franco. Violence between the crowd and a few hecklers broke out; several were beaten or thrown in the River Lee. The intensity of this response is best understood in the context of the militant Catholicism of the Irish Free State where ‘faith and fatherland’ were often seen as synonymous. The Christian Front’s declared aims were to oppose communism, support Franco and raise funds. But, despite the organisation’s non-political rhetoric, there was a more reactionary underlying agenda. The Christian Front’s leadership was composed of Catholic Action supporters, anti-communist activists and fascist sympathisers who believed that the government and laws of the Irish Free State should reflect Catholic principles. Under the presidency of Patrick Belton, a former Blueshirt with fascistic and anti-Semitic views, it was not long before Spain became a highly politicised issue. Propaganda poster of Franco as ‘saviour’ engaged in a religious crusade. It was hardly surprising that an issue as emotive as the Spanish civil war should become embroiled in Irish politics, still poisoned by the legacy of its own civil war. Franco’s popularity had placed Fianna Fáil in a difficult position because de Valera’s government recognised the Spanish Republic, a regime most Irish Catholics now associated with communism. The fervently anti-communist Fine Gael was quick to call on de Valera to recognise Franco, a demand strongly backed by the ICF, the Irish Independent, many local bodies and several bishops. The problem for de Valera was that Irish recognition of Franco would mean joining the diplomatic company of the fascist states and undermining Irish neutrality at a critical time in international affairs. Further pressures arose with non-intervention, the Anglo-French policy aimed at containing the war in Spain by outlawing foreign intervention. In practice, it was flouted by the Soviet Union, who supplied arms to the Spanish Republic, and Germany and Italy who sent large numbers of soldiers and weapons to Franco. De Valera’s support for non-intervention, although the most sensible foreign policy option, was difficult to defend in the face of the widespread Irish belief that Spain was a war between Christianity and communism. Political tensions came to a head during a three-day debate in February 1937 when Fine Gael insisted the government recognise Franco. Their deputies were not slow to play the Catholic card by quoting the Irish hierarchy and Pope Pius XI in defence of their policy. As James Dillon put it: ‘the fundamental issue is God or no God’. However, Fianna Fáil weathered one of the stormiest Dáil debates ever and passed the Non-Intervention Act with the support of the Labour Party. Although Fianna Fáil’s strong stance against the powerful pro-Franco coalition has led to suggestions that the party shared fraternal sympathies with the Spanish Republic there is little evidence that more than a radical minority opposed the prevailing pro-Francoism. De Valera made it clear in the Dáil that his sympathies lay with the Nationalists. Only one Fianna Fáil cumann is reported to have passed a pro-Republican resolution but dozens of Fianna Fáil cumainn and government-controlled local bodies passed pro-Franco resolutions. Given the public mood de Valera’s maintenance of neutrality was a considerable achievement. It was to come under further pressure as Irishmen began fighting in Spain. I didn’t want to tell you I was coming here that day because I was afraid you wouldn’t like it…I have a feeling you hate me for it, but after all, what I have done is for Our Lord, and if I die it will be only for the best. Newspaper accounts convey the atmosphere of militant Catholicism as the volunteers left Ireland. Large crowds gathered to sing ‘Faith of Our Fathers’ as the volunteers were blessed by priests and handed Sacred Heart badges, miraculous medals and prayer books. The Brigade’s organisers told the volunteers they were ‘part of a crusade prepared to fight under the banner of the Cross to help deliver Spain’. Most were to find the war a very different kind of crusade from what they imagined. Following the formation of the Irish Brigade, and partly in response, a smaller contingent of men left Ireland to fight for the Spanish Republic. Led by the left republican, Frank Ryan, and organised by the Communist Party of Ireland (CPI), around 200 Irishmen enlisted in the International Brigades. In contrast to O’Duffy’s men they were predominantly urban, working class and left-wing in orientation (most belonged to the Communist Party, IRA and Republican Congress). Members of the ‘Connolly Column’, as they became known, fought for a variety of motives—anti-fascism, the defence of Spanish democracy, revolutionary idealism, loyalty to the Communist Party and adventure. The far left shared Franco’s Catholic supporters’ belief in the vital importance of Spain. As one Belfast communist declared: ‘Spain is the acid test, on the question of victory or defeat…depends the whole future civilisation’. As with the Irish Brigade there was some discrepancy between the propaganda of its organisers and their real motives. Although the CPI emphasised the defence of democracy as the central motive the International Brigades were also a product of Stalin’s foreign policy and many of its recruits had little sympathy for liberal democracy. (For example, the organiser of the Irish contingent, Bill Gannon, had been one of Kevin O’Higgins’ assassins in 1927). Both sides, although based close to one another on either side of the Jarama front, met with very different experiences. The Irish Brigade was blighted by bitter infighting between O’Duffy and his officers while Franco was unimpressed by its lack of military expertise. The Brigade’s first battle in February 1937 was with another Nationalist battalion who mistook them for the enemy while their next (and final) action ended in failure when the Brigade’s officers mutinied, refusing an order to attack the well-defended village of Titulcia. Drunkenness and indiscipline added to these problems and the Brigade was disarmed and ordered out of Spain by Franco. But there were also difficulties among their compatriots on the other side of the front-line. The great republican tradition of ‘the split’ survived in Spain. On finding themselves enrolled among the English, Scots and Welsh of the ‘British Battalion’ some Irishmen chose to join the American contingent. But in marked contrast to O’Duffy’s men, the ‘Connolly Column’—motivated by more clearly defined political beliefs and part of the more disciplined and committed International Brigades—fought bravely on several fronts between 1936 and 1938, notably Jarama, Brunete, Teruel and the Ebro. Close to a third of their number died in Spain and many more were injured. Soldiers of the International Brigade-[left to right, standing] Peter O’Connor (Waterford), P. McEvoy (Dublin), Johnnie Power (Waterford), [seated] W. Garland (USA), John Hunt (Waterford), 2 February 1937, four days before the Nationalist offensive at Jarama. Meanwhile, back in Ireland the Spanish Civil War was no longer a pressing political issue. As it dragged on and atrocities such as the German bombing of Guernica, a village in the Catholic Basque region, became known the idea of Franco leading a religious crusade became more difficult to sustain. Also significant was the collapse of the opportunistic pro-Franco lobby. By the summer of 1937 the Irish Brigade had returned in failure and the Christian Front had acrimoniously collapsed under its own internal pressures. Even the Catholic church toned down its pro-Franco stance when it was revealed that the Christian Front had gained control of its national collection for Spain under rather dubious circumstances. The Spanish civil war is now remembered in Ireland because of our military involvement there. The old adage that history is written by the winners has not proved true in this case. A steady stream of memoirs, biographies and left-wing histories such as Michael O’Riordan’s Connolly Column ensured that the heroism of the Irish International Brigaders was not forgotten. Its dwindling number of veterans have frequently been the subjects of public commemoration by republican, left-wing and trade-union organisations whose support for the Spanish Republic was often less apparent in 1936. In contrast, the men of the Irish Brigade have remained silent. Many, although characteristically not O’Duffy, wished to forget what proved a disastrous and demoralising episode. Franco’s Irish volunteers were derided for their military failure and, increasingly after World War II, for their support for a cause tainted by fascism. In recent years, however, historians have begun to reassess the Irish response to Spain. Two books published in 1999, Irish Politics and the Spanish Civil War (by the present writer) and R.A. Stradling’s The Irish and the Spanish Civil War have argued that idealism existed among both sets of volunteers in Spain. The romanticised image of the International Brigades has also come under scrutiny following recent studies from the Moscow archives exposing the Stalinist totalitarianism which existed alongside their revolutionary idealism. It seems likely that popular perceptions of the Spanish civil war and its Irish dimension, which have never remained static, will continue to evolve. 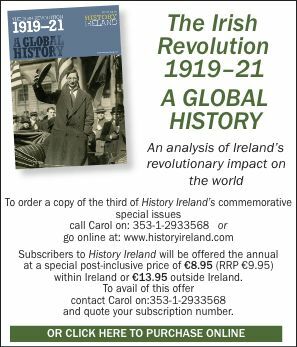 This is not to suggest that the balance of heroism and historical justification does not rest with the defenders of the Spanish Republic, merely that the motives behind both Irish brigades in Spain, and of their supporters back home, were more complex than is now remembered. Fearghal McGarry is Government of Ireland Research Fellow, National University of Ireland, Maynooth. F. McGarry, Irish Politics and the Spanish Civil War (Cork 1999). R.A. Stradling, The Irish and the Spanish Civil War (Manchester 1999). J. Hopkins, Into the Heart of the Fire (Stanford 1998).